Sometimes the story is not so much about what happened but where it happened.. What we are about to narrate is an amazing story not just because it all happened in about a year’s time but because it happened in one of the most conflict ridden parts of our country.. This story also gives you a glimpse into how our relief efforts grow into a full scale rehab operations, driven by the needs of the disaster hit communities. What better place to demonstrate that then the beautiful landscape of Jammu and Kashmir..
September 2014 saw one of the worst floods in the history of Jammu & Kashmir. Starting with rescue work with rafts, Goonj soon built a full time J&K team out of the amazing set of local volunteers who had worked relentlessly with us. By this time we 37th Story were bracing for the second and more difficult phase of severe winter months. Every day the work grew exponentially as we got more connected to the people and their problems. The prime task was reaching out more than 20,000 winter kits to the most far flung parts of Jammu Kashmir, but we soon spread to holding medical camps with local hospitals and doctors and holding free coaching classes for more than 1000 students (who had missed out on crucial study time due to floods). Over the last one year we also started many computer centers, first aid units in schools and 44 libraries with more than 19000 books. Interestingly our work also spread out to the villages bordering the LOC where 500 families were given high yielding seeds and manure. Today when we look back and realize that in the last 14 months more than 27000 flood affected families got support transported in 98 trucks from the rest of the country, it speaks volumes about how the people of this country cooperate!! It’s also amazing how the work just grew organically with a basic trust that things would sort out somehow. Our emphasis on local partnerships and a constant connect with the masses ensured a mutual trust as people came forward to grow the work with us. It just goes to show what we always believe – relief is not just about reaching material, its more about being there with the people even as they work their way back to normalcy. The bone chilling winters of Kashmir posed a big challenge in sustaining the work. Even the local governance shifts to Jammu to function in better weather conditions in winters. For the people who had lost everything, winter turned out to be the second disaster they had to grapple with. It was a difficult time.. We noticed that the migrant laborers, who had come to Kashmir from different parts of the country in search of work, were among the most neglected, even as they were closely involved in the rebuilding of the city. The most neglected, even as they were closely involved in the rebuilding of the city. They have since been the focus of our relief efforts, even as we reached out winter kits, mattresses, quilts and other material to them. We plan to continue working with them in the long term as well. 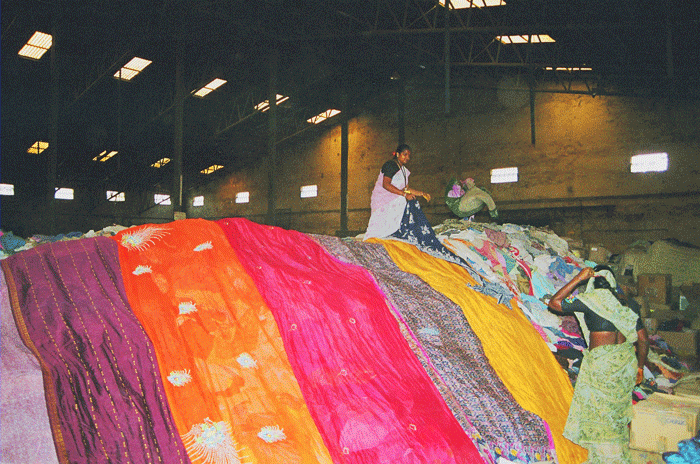 This story would be incomplete if we don’t share about the journey of Cloth for Work here. Like most new places even our own local teams weren’t sure whether people would work for the material!! We moved in gently, nudging communities to work for their own betterment. It started when a few people decided to clean up their community graveyards as a mark of respect to their dead. In another place men and women got together to clean up their clogged drains, proving once again that people choose dignity over charity anytime they have the choice.We knew it wasn’t a one off when a village in the deep interiors of Kashmir came forward to build itself a 5 kilometers long road. Before we tell you about the road we must tell you about Feroz Ahmad from Hassanpora Tawela village, District Anantnag, South Kashmir. He is pursuing an M.A in Urdu. Feroze’s village, like hundreds of other villages, was badly hit by the floods. Of the 504 households in his village nearly 250 families lost everything when their houses collapsed in the disaster. More than a year later families still continue to live in temporary sheds and tents in miserable conditions. When Feroz first approached Goonj we reached relief material apart from organizing a medical camp there. He then got together the village elders and local volunteers to clean 1.5 kms long water canal flowing through his village under the first of four Cloth for Work activities. In October 2015, more than one year after the floods Goonj went a step further with Feroz and his village to build a road to reach their paddy fields. This gave birth to a more ambitious idea; of constructing a link road to connect Hassanpora Tawela with Hassanpora Rakh, under Cloth for Work. Many meetings were held with the village heads, local volunteers and local paddy farmers. There is a lot written and talked about Jammu and Kashmir almost every day, but this story is news of a different kind.. A kind which sounds like music to the ears..
Goonj has been working on varied disasters from Earthquakes to Tsunami, Cyclones, Floods.